BACKGROUND: Common crupina is a native of the eastern Mediterranean region. Though it was introduced to North America (and first discovered in Idaho) less than 30 years ago, it has spread to over 60,000 acres in Idaho and moved into Oregon, Washington, and California. 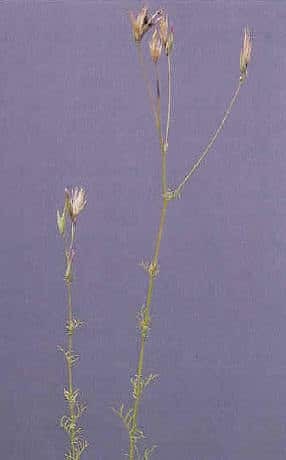 It is usually found on dry south-facing slopes and pastures. It spreads by seed. DESCRIPTION: Common crupina is a winter annual that grows up to 4 feet in height. Cotyledons (or seed leaves) exhibit a bright purple midrib. Leaves are simple and up to 6 inches long, entire near the base of the plant, lobed on the lower stem, and finely dissected on the upper stem. Up to 5 narrowly cylindric seed heads are borne on branch tips in midsummer. Flowers are pink to purple and are followed by dark seeds about he size of a kernel of wheat with a ring of black, bristly hairs at the point of attachment. DISTRIBUTION: Common crupina is found exclusively in the Pacific Northwest and in central Idaho counties. CONTROL: no biological control agents are available for common crupina but herbicides are available that can control this weed.